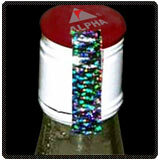 We can provide the Holographic shrink sleeves. Holographic shrink sleeves are a reliable security solution to protect branded bottled goods against counterfeiting and refilling. The sleeve incorporates a tamper evident holographic stripe. We can also do perforation in required area for easy release. 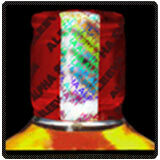 We can print the holographic shrink sleeve in maximum 10 colors. The PVC holographic shrink sleeves can be used for packaging beverages, spirits, condiments, and processed foods.